Though this section is primarily for plantkeepers, it is also the place to find related info, such as Cichlid salt recipes! You might also check the general chemistry section for related information. For a quick jumpstart on CO2, first read this intro by George Booth. Many beginners (and even advanced aquarists) get the different forms of ``water hardness'' confused. Here are two nice articles to help: detailed article that summarizes many of the details presented here, in a single concise manner, and a somewhat simpler one with a historical perspective on the units. See also A little article from the old FAQ. KH, or carbonate hardness refers to the concentration of carbonates, ie CaCO3. GH, or general hardness, refers to dissolved calcium and magnesium. In many cases, these values are similar, because the minerals in your water are dissolved calcium carbonate. In the context of fish liking hard vs. soft water, we speak of GH. However, in discussing CO2, we will be dealing with KH. A discussion on Alkalinity vs. KH, two terms often used interchangably. This article also attempts to explain what happens what happens when you have two buffers (ie, phosphate and carbonate) at the same time. Debate on units (degrees vs. ppm). Conductivity and its relation to dissolved solids. How to make your own African Rift Lake Salts. An experiment by George Booth to measure Ca, Mg and CO3 uptake in a planted tank. The CO2 content of your aquarium is important if you are growing plants (though check out a discussion on which plants need supplemental CO2, and which may actually do worse with it!). But CO2 is also of interest to the general aquarist because it is intimately related to the water's carbonate hardness (KH) and pH; dissolved carbonates will raise both KH and pH, while addition of CO2 will lower pH. Here are some charts showing the relationship between CO2, pH and KH, along with a discussion of the actual chemical reactions. You can read CO2 content indirectly by from the combined pH and KH readings, from a good test kit, or try this simple metering method. A few plants are able to take in carbon directly from dissolved calcium carbonate (a procedure called biogenic decalcification by some). This procedure in turn may cause your pH to rise. 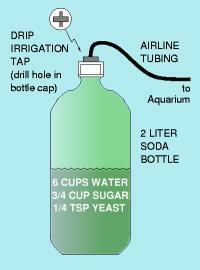 You can easily make your own carbonate buffer from common chemicals. You can use Calcium Chloride to increase GH without changing the alkalinity and pH. Some suggest you can use hydrochloric acid in extreme moderation to reduce the buffering capacity of your water (this article also discusses an empirical result of CO2 content vs. KH). For constructing your own CO2 injections sytem with no budget, you might consider the cheap approach of fermenting sugar in a bottle. Thomas Narten has written an extensive DIY article, and there are also some net postings with other netters' experience on the subject. Beware, this can cause some serious damage to the walls of your house if you do not vent the solution at all times. Several people have constructed injecters using a compressed gas bottle, regulator, and fine metering "needle valve". First off, some disasters that can result from mishandling compressed cylinders... be careful! You can buy a regulator at a brewers supply, welders supply, or beverage supply house. George Booth suggested preset regulators as a cheap alternative to the usual adjustable ones. Here are sources and other info for needle valves and solenoids, the most popular being the ARO NO-1 and the Nupro S Series. If you have a lot of money and/or are very picky, you might want to use a pH controller to regulate the flow of CO2. Jim Hurley was one of the first on the net to build a complete automatic system including an electronic pH controller. (See comments from other folks who've tried to build it, including Sherman Lowell, who expounds and improves on the design on his website.) And Gary Bishop describes an inexpensive alternative controller for such a system, using a photocell instead of pH probe. For measuring the injection rate, you can build a bubble counter. For measuring CO2 level in the aquarium, buy or build an indicator. Though the gas cylinder and the yeast bottle are the most popular sources, there are products coming out on the market every year using alternate means of producing the gas. Here are several experiences with the Tetra CO2 ``bell'' system, which uses compressed gas but requires you to manually turn the tank on and off. Another ``alternative'' setup is based on CO2 cartridges, similar to those used in pellet guns. Here's some (not good) reviews of the Ceomat and bioplast systems, which use chemical reactions. Electrolysis (Carbo-Plus, etc) uses a carbon rod to produce H2 and CO2 gas. One person even theorized using toxic chemicals to generate it. Soda/Seltzer water has been considered by some, though it is impractical and extraordinarily expensive. Finally, there is always human respiration as a means of producing CO2. Once you have chosen your CO2 source, you must get it to dissolve into the aquarium water. Another simple approach is to run the CO2 line into the intake of a powerhead of canister filter. The impeller helps break up and dissolve the bubbles. You can build a gas reactor, which forces the CO2 to quickly mix with rapidly moving water in a small chamber. I (EO) wrote an illustrated article with construction details. So have other people. Relatively new on the scene are ceramic/glass diffusers, available from ADA or Eheim. This method replaces both the reactor and metering valve entirely; The diffuser passes pressurized gas as tiny bubbles through the glass. There have been debates over a possible end-of-tank dump effect if you are not also using a good needle valve to regulate flow. Finally, here are some more diffuser and reactor postings for more info. Nadeem Faiz drew up a nice illustrated diagram showing a full yeast generator, bubble counter, and bell diffuser. Incidentally, you might want to look at what kind of hose and valves you use to transport the CO2 to the tank. Cheap rubber check valves are known to disintegrate quickly from the carbonic acid! The yeast method can cause serious damage to the walls of your house if not vented. There may be different grades of CO2, the lower grades causing possible (unverified) harm to your fish. J. P. Burleson (ex-Dupla USA) pondered the possibility of cannister injection causing ``the bends'' (though the rest of us have never seen it happen). What is the optimum CO2 level for healthy fish and plants? Should one leave it on at night? ponder the mystery of CO2 and ion-exchange water softeners.